CINCINNATI -- There will be traffic jams around the University of Cincinnati’s campus for the next few days. It’s move-in time for the 2018-2019 school year, and a record number of incoming students will be getting their dorms ready. 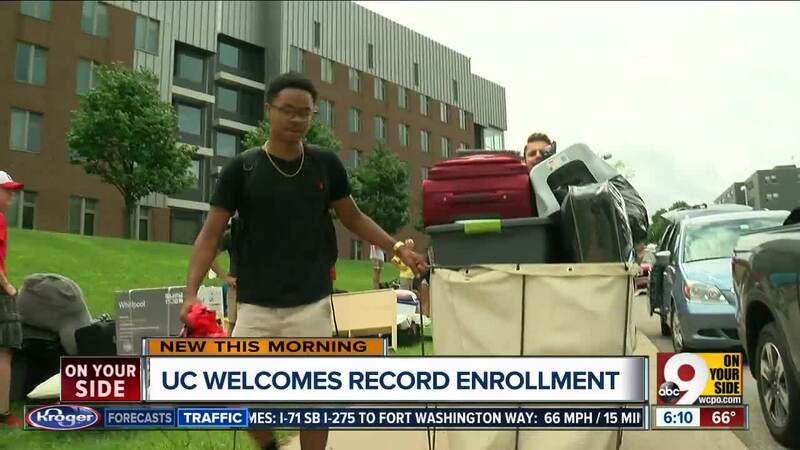 “This year, we’re going to welcome just a little over 6,700 students to campus housing,” Carl Dieso, Director of Housing at UC said. The campus will host somewhere around 45,000 total students for the upcoming school year. This incoming class is the smartest to ever enroll at UC. The Freshmen’s ACT scores averaged 26.3 and had a GPA of 3.6. “They are the most academically prepared students to enter the university,” Byland said. We caught up with new Freshman Sydney Weeks, from Dayton, Ohio, moving into the new Marion Spencer Hall. Marion Spencer is a brand new residence hall, with more than 300 beds, but the demand for housing was so high that it filled up quickly. The university needed about 500 additional beds this year. That means creating extra space off campus. Xavier University also reported record enrollment fort his upcoming school year.